Last fall I was awarded an internal grant to experiment with using an iPad in the classroom. For the most part, the iPad was superfluous. I was leading a graduate level seminar, and as a group we lacked the imagination on how to use the technology to enhance discussion. It became a running joke that the only time we used the iPad was to look up some arcane fact, often on wikipedia. But for the last class we read Nina Simon’s The Participatory Museum, and Nina made the full book available for download for free as a pdf or in any format for an eReader (iPad, Kindle, etc.). This suddenly raised some interesting questions about how we, as readers, were consuming texts. For various reasons, my students often don’t buy their books, opting to use copies from the library. (Keep thinking about printed books while recognizing that USC’s library allows students to rent iPads.) Nina’s generosity allowed students to experiment with different formats to read the text. Despite being freely available in digital format, about half the class (6 students) still opted to buy the physical book, 2 students read the book online in pdf form, and 4 read it on eReaders. The experiment made me think about how we visualize books, which may be a bit out of scope for this working group, but I would argue is a cantilever (not necessarily a full bridge) to visualizing other types of information. I have a lousy memory for content, but I am great at remembering where I read something, and it is a very visual memory. I can remember what side of a page the information was on and how the page was laid out (paragraph blocking, section breaks, etc.). This makes it very easy for me to look things up. The static page is now gone. My 300-page book became a 900-page eBook, which could dynamically change depending on how big I wanted the font. The flow of the digital page made it difficult for me to remember specific content. The differences in formats made discussion with reference to the text more challenging. I am curious how dynamic digital texts are changing our comprehension and retention of all types of information. Does anyone know of anyone who is tracking this (in formal or informal settings)? I have an idea for a project that I have been batting around for a few years, but so far have lacked the funding or institutional support to move forward with any great speed. The concept is simple: I would like to digitally reverse the diaspora of objects from museum vaults back to their original site of creation of use. I would like to create an app that asserts the primacy of place in object-based learning. Basically, I would like to be able to walk down the street and have my phone tell me what museums have saved stuff from the site. In my ideal vision, the app would draw from all types of museums, so you could see artifacts from art museums or history museums, small museums or national institutions. Perhaps I should settle for a working prototype of a few objects/repositories. I have been working with a group of graduate students to develop an online exhibit based on the textile industry in Columbia, SC. 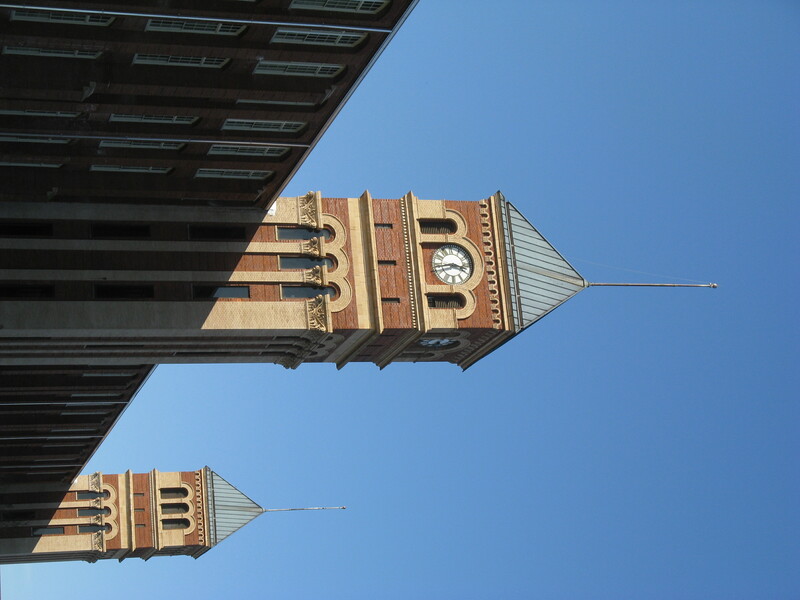 We are tracing the history of Olympia Mills, which was a grand structure when it was constructed in 1899. (It is listed on the National Registry.) The mill closed in 1996. It has since been converted to apartments. The National Museum of American History happens to have the original architectural drawings for the mill, as part of the Lockwood Greene collection. I would like to georectify these drawings with the current interior design of the building, so that the apartment dwellers could visualize the history the space. For example, show that their bed sits where a loom once was. Then link to a stereoview from the South Caroliniana Library that shows a row of looms. But right now this is mostly a dream, and I think I need to do some more groundwork in order to secure funding. I am going to set a personal goal of trying to conduct some front-end evaluation of Olympia Mills residents before our working group convenes at NCPH. 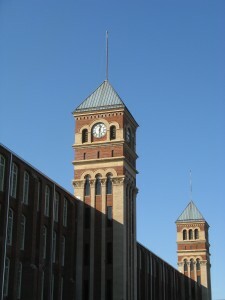 Did you know that the Smithsonian has the original drawings for Olympia Mills? Why do you think the Smithsonian saved them? What do you know about the history of this site? Would you like to know what your apartment looked like when this building was a functioning mill? What other types of questions do you think I should ask in a front-end evaluation? Can anybody point me to other similar projects/resources? How many types of visualizations? I spend a lot of time reading blogs about data visualization (probably too much, which is why I haven’t been contributing any longer posts to this blog!). My favorite is Nathan Yau’s FlowingData. A few days ago he published a link to an article from ACM (the Association for Computing Machinery — a wonderfully anachronistic handle) called Interactive Dynamics for Visual Analysis. The authors write, “The goal of this article is to assist designers, researchers, professional analysts, procurement officers, educators, and students in evaluating and creating visual analysis tools. We present a taxonomy of interactive dynamics that contribute to successful analytic dialogues.” I don’t understand all of the technical details, but the taxonomy is certainly relevant to our discussion about visualizing the past. Plus, I like the idea of visualization as one mode of “data-wrangling” — i.e., another tool for historians to use to make sense of an incomplete historical record with too many data points. With all of the excitement about new interfaces to visualize the past, it’s easy to forget the old standby: the timeline. It has the power of simplicity, the challenge of over-simplifying. And in museums it has a visceral appeal: walk through history! I’ve written a bit about the timeline, at too much length for an easy post, for an article. I’ve embedded a draft here, footnotes and all. Any comments, suggestions or examples most welcome. Over the past few years, it has become clear to me that this venture, called here Visualizing the Past, is one of addition not of subtraction. That is, museums will add digital media to their skill sets, but this media is unlikely to replace the current ways we connect to communities of learning. Museums will increase the number of people we serve, primarily by the elimination of geographical constraints of collection sharing. Smaller not-for-profit and very local organizations like mine (annual budget $1m, FTE equivalent 9.5) will be particularly challenged to ensure they engage broader audiences though these means. We’ve all heard the joke of being roadkill on the information highway. This is a real problem for museums focused on local history. About 40% of all museums in the US are history museums. We are tied in a very real sense to place. As a result the media which trumps geography also trumps localism. Not to add digital media to the work of local history is to disappear from the view of huge numbers of people. With our limited circumstances, local history museums are going to have to learn to adapt existing platforms such as Flickr, Facebook, YouTube, and open web sources such as Weebly. It was encouraging to see Phil Katz’s posting of Merete Sanderhoff‘s report to Danish museums on practices in the US. The work of local history museums, will at best, be workman like, solid, not necessarily cutting edge, inexpensive, forgiving and fun for their users. Online archival finding aids— The Museum will continue its project to post finding aids of its archival holdings on our website. We currently have 90 collections on our website. This project will post an additional 110 collections. The Museum has found that since it began posting online finding aids relating to our archival holdings, the number of research queries from researchers around the world has increased dramatically. Collections database— The Museum will create or adopt a public portal to its object collection. With 98% of the Museum’s collection cataloged on the PastPerfect database, the Museum will explore affordable ways to share this data though the internet. We may select the national portal being developed by American Heritage Magazine. Integration of digital technologies into exhibitions— The Museum has taken on a project to renew its longterm exhibit, Encounter on the Prairie. One of the enhancements is to use digital technology in creative ways to reinforce the interpretative themes. We are currently testing and evaluating Quick Response code interactives, targeted at smart phone users. A current application of QR code we developed connects people to downtown architecture. Other enhancements call for the use of Facebook as a platform for visitors (virtual or real) to post images of their office environments,encouraging comparisons make to a circa 1945 State Farm Insurance office recreated in the exhibit. A kitchen vignette/Facebook page will invite similar comparisons. Smart Boards will be installed in two galleries. Presentations on them will be conducted by Museum staff to enhance school tour presentations. There are numerous opportunities where we can engage visitors in participatory exploration of historical topics. The Facebook pages will require management, and the Smart Board presentations will need design work. The Museum will use interns and volunteers to supplement staff for this work. We currently work with an average of 12-15 university interns a year. Our volunteer program engages 217 active adults in over 15,000 hours of learning activity a year. These projects will also connect volunteers and interns in new ways— providing an opportunity for students and lifelong learner/volunteers to engage in the development and dissemination of digital based information. We have already been very successful with interns and volunteers in digital projects, such as PastPerfect cataloging, desktop publishing, internet publishing and the development of online archival finding aids. We will also use this project as an opportunity to recruit high school students for digital-based volunteer projects. We have been successful in recruiting and training a diverse group of community members to work with us, due to our policy of engaging them as fellow workers and learners. Our annual retention of volunteers is at 98%. This is not glamorous, but it is the day-to-day work of a local history museum. With our resources, this is how we will be Visualizng the Past. One of the first problems I identified on becoming director of the museum was its collections management system. It infuriated me. The interfaces were arcane. The data was imprisoned in a proprietary system – one that seemed designed to make reports difficult and information sharing impossible. It was complicated, to the point where most of the staff just stayed away and asked the one person who could figure it out to use it. I’m not mentioning names. It’s a fairly common problem. Like most collections management systems, it was designed to make registrars happy – and with its careful tracking of changes, its built-in thesauri, its many, many fields – it served the key purpose, and the key audience. It just wasn’t designed to be used to share information. I looked into changing it, and ran into the perfect storm of bureaucracy, money, staff expertise. Who could tell us what the university might provide as a server? What would it cost? We needed to know more from the vendor. The vendor was in the process of bringing out a whole new system that would solve all our problems, any month now. (A year later, still to come.) Getting straight information was difficult; getting all of the people who would be necessary to understand how that information would work in our context into one room, real or virtual, was almost impossible. And so I put off a decision on replacing the software, and looked into other possibilities. What if we kept the collections management system and occasionally dumped the data from it into an online system like Omeka? What if we set up a database server online? How about the Library of Congress’s Recollection? The data, it turned out, was pretty well trapped in our existing system. Who owns that data, anyway? There should be a guarantee, with any system, that you can get your data out. A year later, I’ve started to consider this again. Let’s consider first what I want a system to do. It needs to serve the registrar, of course. But what if my goal was not only to keep track of what we have at the museum, but rather to make the information about it available as freely as possible? What if I wanted to not only let users search it and view it online, but also to link to it? The point of a thesaurus is to allow for interchange, after all. Why shouldn’t they be able to download the parts of the database useful to them, to do with it whatever they like? Why can’t there be ways to call up collections from several museums to compare? Or to consider as a single whole? Anthropology museums use “cultures” to categorize their collections – why can’t I see all of the objects from a “culture” in all museum collections? Museum collections systems now are instruments of control over objects. That’s the word librarians and registrars use: physical control and intellectual control. But what if we said they are instruments of access, first? Take control for granted, and think about ways to make the information available. That’s what makes museums useful. I don’t know if information wants to be free, but I want my information freed! Content and Context: Visualizations for the Public? In the very useful survey of the “history web” in their 2005 book Digital History: A Guide to Gathering, Preserving, and Presenting the Past on the Web , Dan Cohen and Roy Rosenzweig identify the range of genres that encompassed the historical content on the web: archival sites, exhibits and scholarly essays, teaching and learning sites, and discussion forums and organizational sites. Even though Cohen and Rosenzweig failed to account for the way that blogs, YouTube, and social media would eventually permeate the history web, I like their categories because they continue to the give us a way to think about what we do when we create public history online. We tend to provide access to collections, to offer interpretation, to offer instruction, and to offer a forum for conversation, both general and professional. So, as I began to think about the critical issuing in effectively using data visualizations in public history, I wanted to consider them in relationship to the activities above. Since Sheila has already written a great post on collections and enhancing access with visualizations, I’d like to focus both on their interpretative and instructive use, building on Trevor’s thoughts from his last post on discovery and communication. For public historians, the mode of online outreach that has the longest history is that of interpretative exhibits, whether as companions to a physical exhibit or as independent works of scholarship. Despite the liberating possibilities for disjunction, many of exhibits hue very closely to the linear narrative structure of traditional narrative history. In doing so, they have demonstrated varying degrees of success in offering the public a glimpse of the richness of the past. Two sites from the National Museum of American History demonstrate the wide range of approaches. Both “The Price of Freedom” and “A More Perfect Union” are beautiful sites, but one presents a linear and reductive narrative of military history and the other presents the difficult topic of Japanese internment during World War II with a range of voices and perspectives that highlights historical complexity. The difference here is in the effort to bring together evidence in a user interface that allows for the consideration of many perspectives and multiple causality, as opposed to offering a single perspective that simplifies the past. Successful or unsuccessful, most exhibit sites have the benefit of offering visitors a range of contextual information in both the text of the basic narrative and in the descriptions that accompany individual artifacts, images, or documents. This contextual information is essential for a public who may not have a deep background to bring to their encounter with primary historical materials. Data visualizations can short circuit the tendency to present simplistic narratives about our collections. Unfortunately, however, data visualizations that concentrate the user interface into a single interactive screen can also significantly reduce our ability to offer the public necessary historical context if we’re not careful. The Digital Vaults site from the National Archives and Records Administration, on the other hand, was created precisely to engage the public. Unfortunately, the project is completely hampered by its abstraction. The Flash version of the site gives users access to a seven randomly selected sources from a database of over 1,200. Clicking on a document, the user enters a web of connections to other documents based on shared tags. (The HTML version simply offers an alphabetical list of tags.) The sources have minimal accompanying metadata–usually title, date, and a brief description. While this environment is attractive and fun to play with, it fails to offer users enough context to make any historical sense out of the materials they encounter. Rather than offering and entree into NARA’s rich collections, the site leave users at sea with only their pre-existing historical knowledge to support them. Unlike Digital Vaults, visualizations that make use of geospatial and temporal cues offer users more necessary orientation. One successful example is Minnesota Historical Society’s True North project, which offers users the ability to layer information in space in time to glean some understanding of the state’s history. While the interface does not link out to individual primary sources, it manages to offer enough cohesiveness that users can start to construct their own narratives of change. The National Museum of Australia’s History Wall is even more successful. Built on the backbone of a flexible timeline, the interface allows users to explore the lives of Irish in Australia between 1770 and the present, drawing on, among other things, the Australian Dictionary of Biography, and amazing Trove database that aggregates over 280 million sources from National Library of Australia. Together these elements let a user to explore within a much more deeply layered context that can push them to use heuristics that are important to historians as they make sense of the evidence from the past. Considering this range of examples, I hope that we can begin to have a conversation about how to create and frame data visualizations that provide the public with new ways to access our content but also offer them enough context to help them begin to make sense of those materials in meaningful ways. Communication or Discovery: Which Approach for Public History? It strikes me that there are two, somewhat overlapping, reasons that we do visualization. They are a method of communication and a method of discovery. Visualizations are methods of communication, ways of communicating something that we already understand. In this case, things like Tuftee’s work on presenting data and information is squarely about communicating known things. Similarly, most of what I see on flowing data strikes me as this communicative tradition. In the realm of historical thinking and scholarship David Staley’s ideas about Visual Secondary sources in Computers, Visualization, and History: how new technology will transform our understanding of the past forward this communicative notion of visualization. 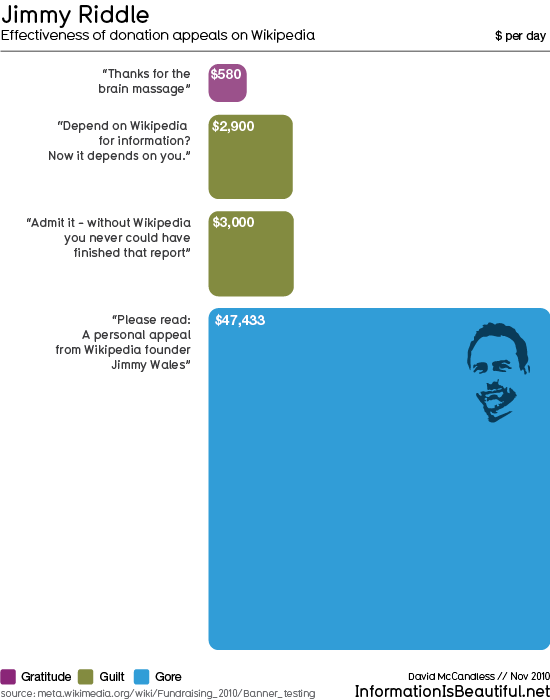 To make this a bit more concrete, the image below, from information is beautiful, illustrates (and illustrates is a key term) the effectiveness of different approaches to fundraising for Wikipedia doesn’t really tell us something new. All of the data is up online and if we read through the data the relationship is evident. The graphic below just communicates that relationship more forcefully. Visualizations are also tools for discovery. In this sense, visualization is a method for finding out new things. Even in the case of something really simple, like Wordle, we create something visual that we can then examine and explore for a potential new ways of seeing or understanding something. 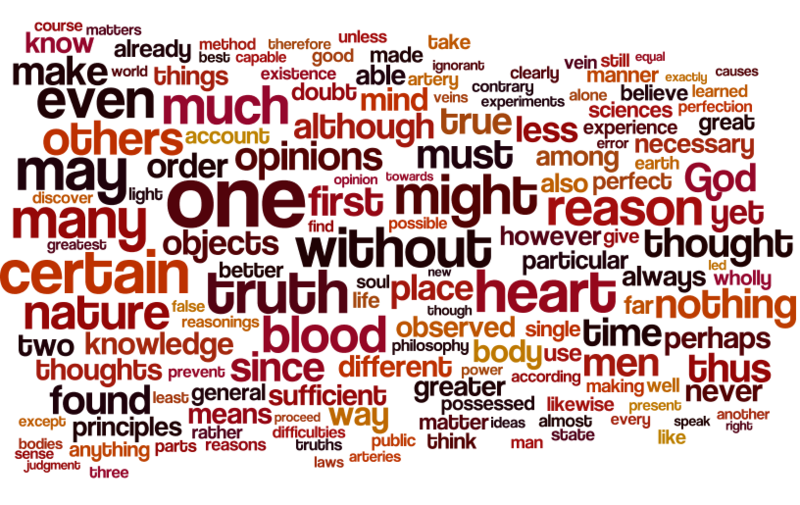 For example, in the Wordle below I feed the entirety of René Descartes Discourse on the Method of Rightly Conducting One’s Reason and of Seeking Truth in the Sciences from Project Gutenberg into Wordle and was then presented with the following representation of the book in a word cloud. I did not know what I would get when I hit the button. The result is not particularly good in terms of communication, largely because I didn’t intend it to communicate anything. I just wanted to see what would happen. Now in this case, I find it interesting that things like “heart” and “blood” are as big as they are. If I were interested in taking this further I might go back to the text and try and suss out why this is the case. Now, if you don’t want to use the kids-table version of this sort of thing you can pick up something much more sophisticated and do things like Now Analyze That. This line of thinking, of visualization as a method of discovery, is largely in line with Jessop’s ideas about Visualization as Scholarly Activity, and Drucker’s notion of Graphesis , wherein visualization is understood as “generative and iterative, capable of producing new knowledge through aesthetic provocation.” I think this is also very much what Moretti is talking about in Graphs, Maps, and Trees. 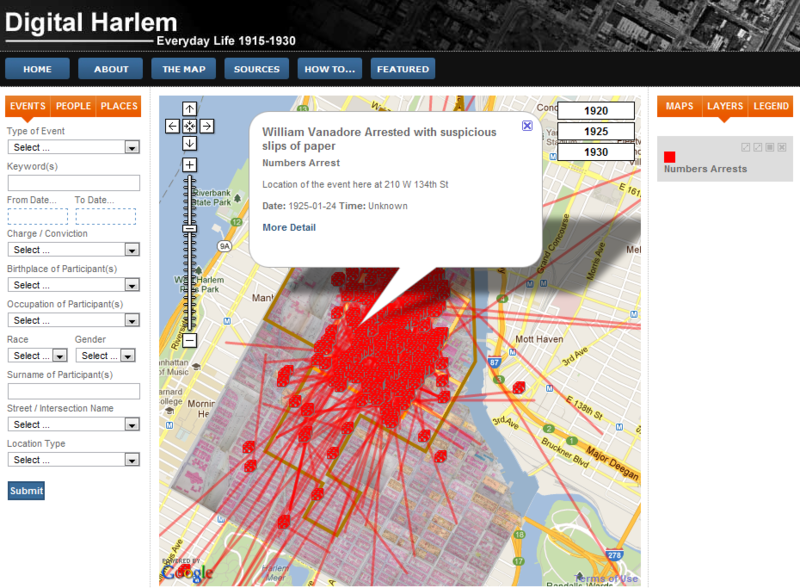 Is Public History Visualization Somewhere In Between? For me this becomes a central question. What is the goal of visualization for an online exhibit, or a cultural heritage collection? Do we want to communicate something we already know as clearly as possible? Or, are we trying for the generative and iterative new knowledge producing capabilities of aesthetic provocation? In some cases, I think there is also the possibility of attempting to put something in the hands of the public that lets them engage in their own exploration and discovery in the context of a collection. 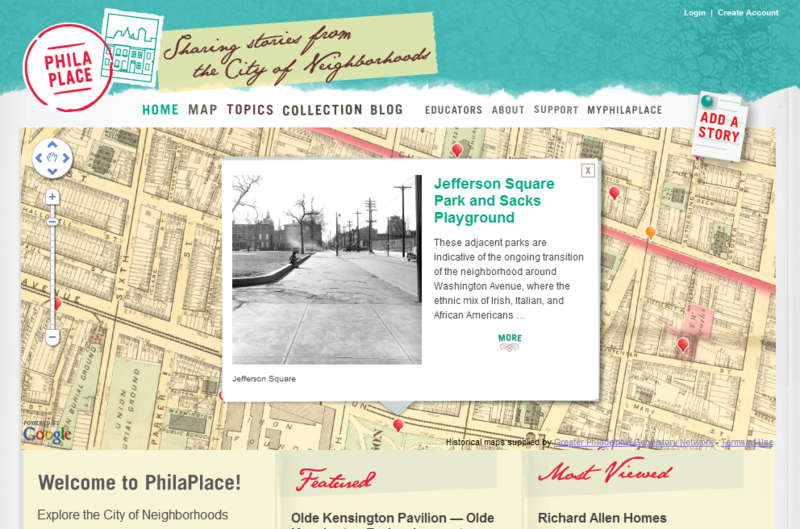 For example, contrast Digital Harlem and PhillaPlace. Both offer map based interfaces to cultural heritage data. Both let us explore in our own ways. With that said, I think Digital Harlem falls much more on the side of providing a messy-data-sense-making-discovery-place while PhillaPlace offers a structured visual communication space. In the image above you can see the dense interface to Digital Harlem which invites us to poke around in the data they have gathered together and explore how the picture changes as we poke. In contrast, the point of entry to PhillaPlace is a map that moves on it’s own. We see the cultural heritage points flip through. While PhillaPlace does offer a rich map interface, it is less about surfacing any patterns in the underlying data and more about giving you a way to browse via location. What Approach to Visualization are You Most Interested in and Why? I imagine that there are going to be different answers to this question in different situations. With that said, I think it is essential that anyone thinking about using a visualization have a really good answer to the root of this question. That is, why are you making a visualization? I would be curious to hear from the group, and anyone else listening in. What exactly is it that you want to get out of visualizations? Are you trying to communicate something as clearly as possible, or are you trying to generate something messy that we can use instrumentally to develop new knowledge? Today at the Center for the Future of Museums (CFM) blog, a look at “mobilizing museum archives.” Discusses a project that uses historical records (images and field notes) to explore biodiversity in Colorado via crowdsourcing. The specific project is a good model, and the general point is highly relevant: “We live in a world that is increasingly digital. While museums are gradually adapting to this new reality, it is crucial that we complete ongoing digitization projects with minimal resources and a maximum of community engagement.” I also recommend the blog So You Think You Can Digitize, which is curated by two of the guest authors over at CFM. When thinking about our session on ways to visualize the past through cultural heritage collections, I found that my ideas fell into two broad categories: how institutions might visualize individual objects and collections; and how researchers might want to use those objects and data for their own research. What follows in this post are some of my initial thoughts about what museums and individuals are doing now and challenges facing them. Institutions often represent individual digital objects with a visual, like a photo with a caption and some metadata. Still, very few museums, libraries, or archives are doing much else to communicate visual details and meaning of physical objects online. Scale: One of the biggest challenges in representing artifacts with digital images online is to illustrate scale. ArtsConnectEd is one of the few sites I know of that deals with scale by including dimensions and by using a visualization of a hand, elephant, building, to communicate scale: http://www.artsconnected.org/resource/21248/12/8. Movement: Two-dimensional images of 3D objects are generally all that is available, while dimensions, depth, and full examination of an object can be difficult to visualize as a user. QTVR is not used very often, even though this type of software that sews together multiple images of an object to create a 3D representation has been available for nearly 10 years. While possible, this process can be time consuming. Few history museums incorporate an inexpensive option of using short videos to can create a similar effect. Pieces of a Whole: Most history objects are related to other objects and embedded in stories about their production, exchanges, owners, uses, significance. Some of these things are part of a set, one of many related pieces–think of pieces of the USS Maine spread out across US—or panels from the Migration series, a factory whose pieces have gone in many directions. Though it is possible to re-connect disparate pieces online, this practice often is not done. One example is the King’s Kunstkammer, a partial reconstruction of the Royal Danish Kunstkammer (a large cabinet of curiosities) that currently exists in several physical collections held in several different museums. http://www.kunstkammer.dk/GBindex.shtml The design tried to mimic a cabinet and the idea of rooms, which actually is useful in visualizing the cabinet as assembled by the King. Geographical Movement: Representing the geographic life of an object, visually, is extremely challenging since most mapping software only allows an item to contain one location. Are there ways to store lat-long data that can be mapped to show how an object is created and migrates, such as the life of a t-shirt (field-to-factory analogy)? A researcher could create their own visualization of an object using their own map, but it would be nice if an institution could represent its objects connecting multiple data points on the same map. As a researcher, I may want to use and interact with online collections to create some of these networks, for instance, but am often foiled by step one: finding collections and data online! I’ve found in my survey of US history museums that only 17 percent of those museums provide a searchable databases for users (level of data available varies by institution), while 37 percent offer no collections information at all (not even a finding aid or a summary). If you are interested in objects, there just isn’t much there. Once I locate relevant collection objects online, often there is no way to harvest data, other than by copying and pasting into a database that I create. For example, the Arago site contains a huge online database of postal history resources, but I can’t get any of it out of Argo easily. A small number of museums offer APIs, and finding public OAI-PMH sets is challenging. Once I, or an institution, create a database of object data, there are tools like ViewShare that then offers options for visualizing this object data that can then be shared. But, the task of formatting, entering/creating, normalizing data requires a lot of labor ahead of time, and even more so if a museum works at the object level or is creating unique networks for objects (recording individual videos, adding icons that symbolize scale, geolocating). One option for institutions would to make their collections available and the data harvestable in some way. LAMs might find that researchers are more than willing to share their “curated” data back with the institution for others to see/use/learn. Most of what I outlined above probably seems extremely obvious. The reason for sharing these thoughts was to keep in mind that while there are different ways to represent collections and to use collections data to formulate new scholarly questions, a lot of work is involved just getting to the stage of creating a visualization. I am most interested in working with the group to see if we can figure out ways to visualize movement/migration of items (could apply to people too), and to represent networks of objects or an object’s network.